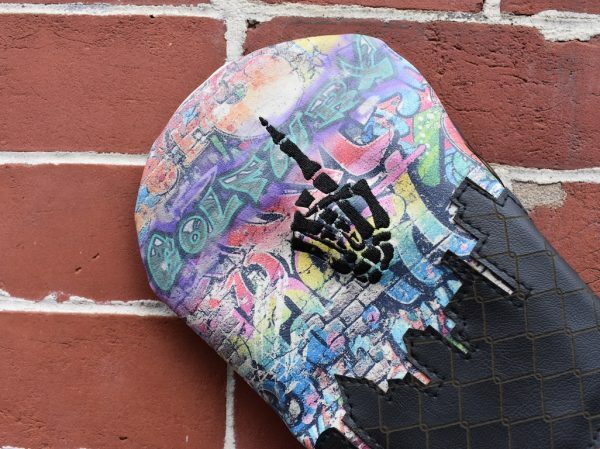 We last talked with Alonzo Guess of Sunfish in November of 2017 after the Nashville-based company launched a custom headcover and accessory builder on its website. The company has been producing custom headcovers, yardage books, and other accessories since 2013 when it entered the market with its signature wool headcovers. We wanted to see what was up, and Guess was kind enough not only to answer a few questions, but to design a pretty incredible GolfWRX driver cover using some raw assets we sent over. BA: What’s new at Sunfish since we last talked? AG: 2018 was a great year for innovation at Sunfish. We worked hard to develop new design and construction techniques, and it has been really exciting combining these new creative elements into one of a kind headcovers and accessories. 2018 was our eighth year in business, but it was probably the most significant in terms of innovation. We’re excited to see where we can go from here! BA: Looking at your websites, I know one of the new things you developed is something you call Photoflux. What exactly is Photoflux? BA: How the heck did you come up Photoflux? AG: A customer ordered a scorecard holder with his family photo to be embroidered on each side. We made the piece and weren’t happy at all with the result. The embroidery process couldn’t do justice to the photographs. It was clear that there were certain limitations to embroidery, and we were motivated to overcome them. After months of trial and error, long hours and strenuous testing against sun, rain, and wear, we developed the current process. BA: What are ways the Photoflux process can be used? AG: Photoflux is perfect for applying photos, but can also be used for intricate logos or family crests. Really any graphic element can be expressed accurately using Photoflux, including shading. Recently we’ve had fun developing custom patterns such as tiger fur and using them as stripes on headcovers. The sky’s the limit! Photoflux is best in concert with other design techniques, such as embroidery, laser engraving, and precision cutting and sewing. The featured piece (shown in this feature) incorporates Photoflux, precision cutting and sewing, laser engraving and embroidery. The result is as much artwork as it is a functional golf accessory. BA: What are the limitations of the technology…what products can you apply Photoflux to? AG: It’s great for leather and Duraleather headcovers, putter covers, scorecard and yardage book holders, alignment stick covers, cash covers, valuables pouches, wine bags, barrel style tartan headcovers…and even copper ball markers and divot tools! 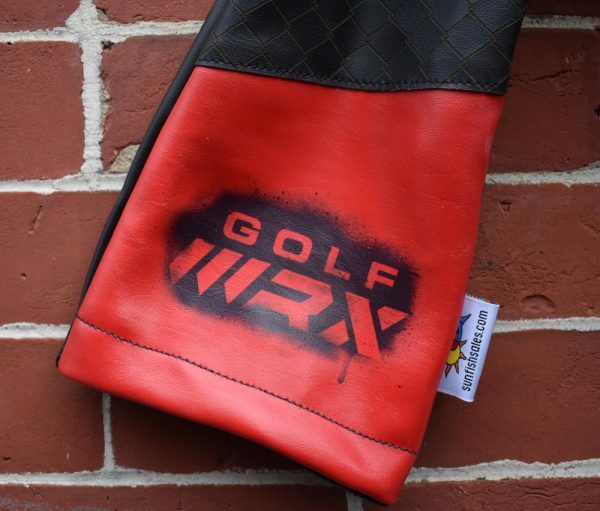 BA: Tell me about this headcover you made for GolfWRX. I suggested the use of a graffiti wall, a GolfWRX logo, and skeleton hand holding up one finger to denote one club/driver, and you really went to town! 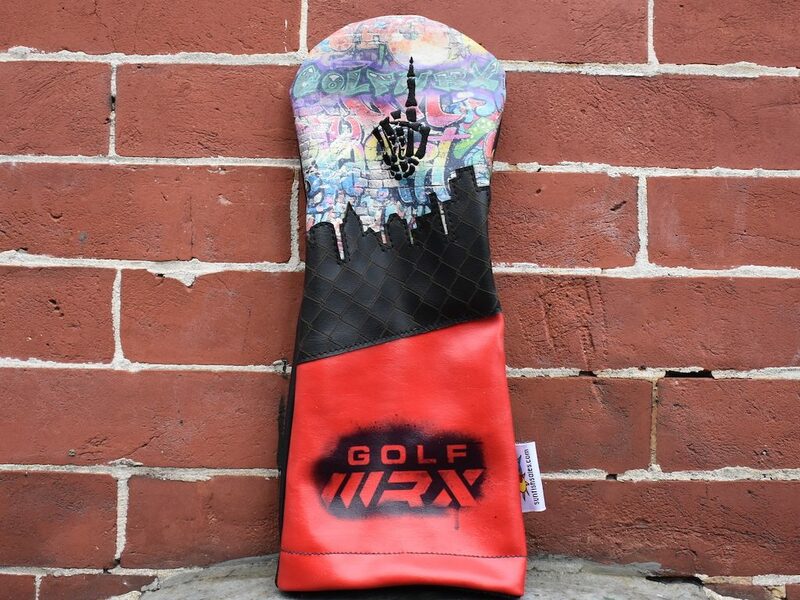 AG: So for the headcover you have, we used Photoflux to apply the graffiti wall image to the top of the cover (did you notice the ‘GolfWRX’ spraypaint in there? We threw that in there for you as an Easter egg!). On top of that, we embroidered the skeleton hand. For the stripe, we laser cut the outline of a typical urban skyline, and laser engraved the chain-link fence pattern over the top, than sewed that down. The bottom portion is a Photoflux image of GolfWRX that you sent over. With so many new ways to decorate and manipulate the materials, we’re really excited about combining it all for our fans and customers to create really unique products. 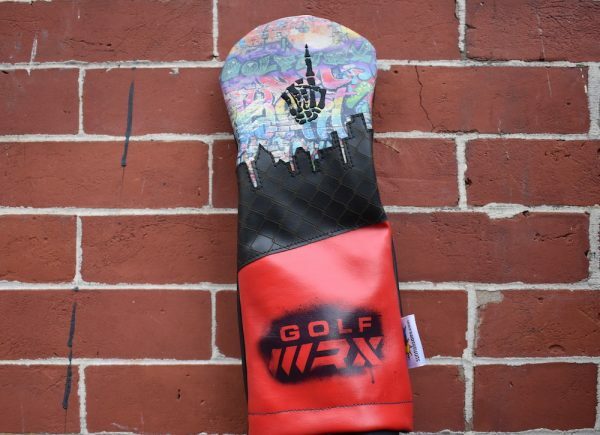 We feel the sky is the limit, and we hope this headcover illustrates that.